I am happy to announce that Laurie "Ferrari" Basile is taking the Presidents helm from Bob Radefeld who's done an impecible job as President, encourager and leader of the Central TPR division representing us at the Sandhills Open Road Challenge for more years than I can remember. Most of you already know Laurie who is the only woman Pantera owner/driver to have ever started and completed an open road race and she has done that twice. Laurie has also published numerous articles in the POCA and Ferrari Owners Club monthly periodicals. Laurie just wrote to confirm her draft of a new history book about Team Pantera Racing with color photographs, including information on the members and the events. She expects it to be published shortly. With all her racing, business, community, media, photography and writing skills she will not only be an asset in her new role but will help expand and report what we are and have been doing since 1989. Laurie can be reached through ou contact form. With Race Season in full swing please send your photographs and stories to Laurie. Also in the news, our webmaster Asa Jay has an expanded community role of late, in addition to a new promotion at work. This keeps him extremely busy, but will still work to make the SSCC Event in September. Even so, he still tries to put in a little time for our web site. If you can help in any way, please send your articles to either Laurie, or Asa. The Mad Dog has moved to the Pacific Northwest. 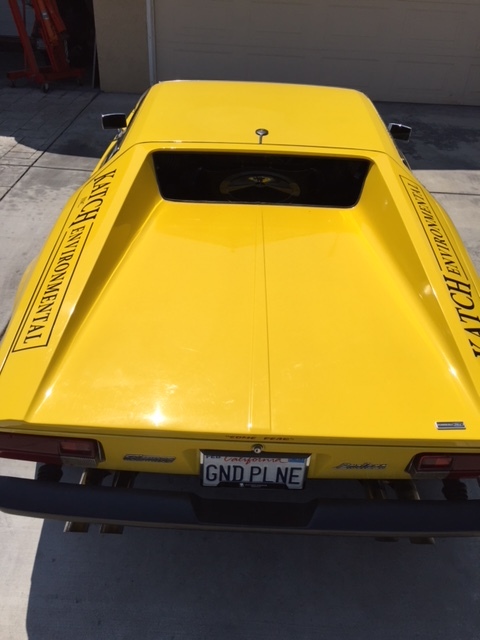 Now residing in a secure location near Portland Oregon, the Pantera driving race fanatic is now recruiting other Pantera owners/drivers into local open track events. His plan is to mix it up with other Panteras and use the local events as a recruiting tool to get more interest into Open Road Racing. Right now we have 4 Pantera's registered to run at Portland International Raceway Friday, May 3. And we have two more members (Mary Ann Antenucci and Doug Braun) planning to run their 'other' rides which should be just as much fun. The link below includes 31 entries to date. But of that number there are only 4 vintage automobiles entered and they are All DeTomaso Panteras! Think about that, as it is something we can all be proud of. That example pretty much follows every other open track or open road race event I have participated in up and down the west coast. No club ever shows up to race 3 or more vintage automobiles. It just doesn't happen EXCEPT with owner's of Pantera's. Others I know who are working/wrenching/painting/polishing a Pantera are Lee Peterson, Ron Wade, and Dave Londry. and probably others who are flying under the radar or those I forgot....but honestly when the SoCal boyz can't get more then one Pantera to Willow Springs what you guys have done is again something pretty cool. But its all about having some fun and enjoying some camaraderie. And that is exactly what we are going to do. Remember - there are two Novice groups (Beginner and Intermediate) and one advanced race group for experienced racers and one other test & tune group for driver's with a race license. Send your questions or comments on the event,directly to me. The 2018 running of the Silver State Classic Challenge (SSCC) is in the history books with four Panteras participating and two finishing, one with a second-place trophy in the 120 MPH class. 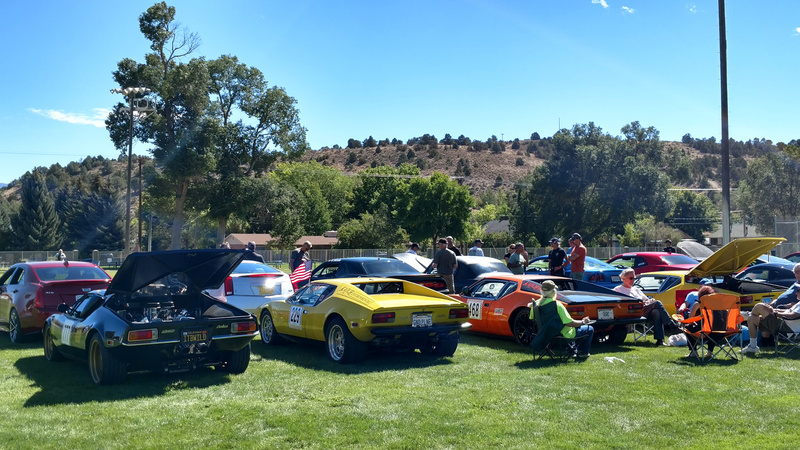 Despite hardships encountered by all Pantera drivers, the event was still a great time to get together and bask in the glow of Pantera ownership, camaraderie and serious racing. Mark Skwarek, Gerry Romack, John Bentley and Dennis Antenucci all brought their Panteras to run in this year's race, and each has a story to take home. Mark Skwarek travels the longest distance of any Pantera racer, all the way from Connecticut. To prepare for this year's race, Mark had his engine removed to find cracked pistons, broken rocker arms, broken lifter links and other smaller issues. After having his engine builder sort it all out, he came to SSCC to take on the 160 MPH class in his Orange and Black Pantera. Mark has participated in many Sandhills Open Road Challenge (SORC) races and sports a personalized license plate with "SORC" on it. The Tech inspectors at SSCC were hesitant to let him pass tech unless he took the license plate off, but eventually let him through, in a bit of competitive ribbing. Mark was pretty much ensured a trophy since there were only three cars in his class. Unfortunately, Mark noticed problems with how the engine was running at speed, apparently from a fuel problem and he decided to terminate his run at about 25 miles into the course. After the race was over, he drove the Pantera toward the finish line at the posted speed limit without issues and met up with Peter Menyhart who was driving Mark's trailer to pick him up. Disappointed in the early withdrawal from the race, Mark is nonetheless excited to come back and make the challenge again. 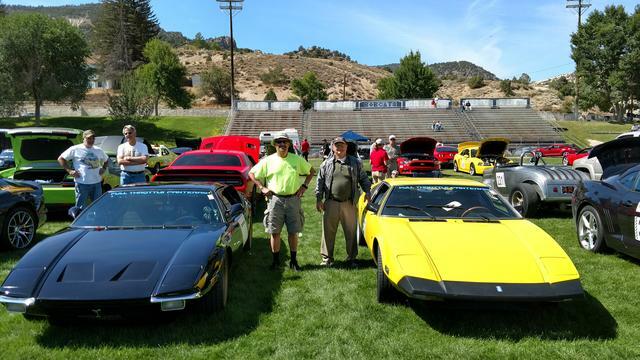 Gerry Romack, the current President of the Pantera Owners Club of America is the Pantera driver with the second longest distance driven, hailing from Illinois. For this year's race, Gerry worked on repairs to his brake system along with some engine changes for smoother operation on the street without sacrificing much on the top end. He also added a new set of 5-point racing harnesses so he could enter the 120 MPH class. Everything was going Gerry's way until he got to the start line, where the green flag was waved and immediately got the red flag in a burst of steam from the radiator. In his later forensic analysis, Gerry found the fan controller appeared to have failed, leading to excessive heat build-up in the cooling system, which let go at the start line. Since Gerry's trailer was at the finish line, he found a ride on an empty trailer belonging to one of the unlimited drivers. They brought his car to the finish were it was transferred to his trailer. Later at the SSCC banquet, Gerry was honored with the SSCC Hard Luck award, a bit to his embarrassment, but it showed the determination of open road racers to prepare and get to the start line, even if they don't manage to finish. The team would like to encourage Gerry to keep the faith and perhaps come back next year to challenge the 120 MPH class for a trophy. Dennis Antenucci used his off-season time to have his engine completely checked-out, the fuel injection system re-tuned, new harnesses put in, completely new brake system installed, and get a fender fixed. The fender incident occurred when his Pantera was being offloaded from its trailer just a few weeks prior to the race. Undaunted as he always is, the Mad Dog in him simply scheduled time with his bodyman to do a quick repair making the Pantera look whole, with a post-SSCC follow-up appointment to smooth it all out properly along with a repaint. In year's past, the oil pressure and temperature in Dennis' Pantera had been running right where he wants it, but in the race just prior, he felt it was running too hot. 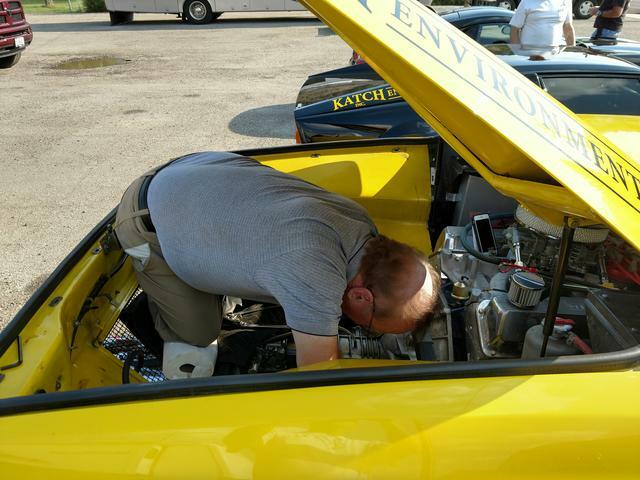 With the help of David Adin and Asa Jay Laughton in person with Dennis' Pantera, and Russ Fulps (Dennis' engine builder) remotely via email, the team check the placement of the temperature sending unit as well as the oil pressure unit. All seemed fine. During the race this year, Dennis noted the temperatures ran between 220 and 230 the entire time, with the occasional peak near 240 at higher speeds. This range was comfortable to Dennis and allowed him to finish the race fastest in his class again this year. His Pantera ran beautifully for the race, unfortunately, the same couldn't be said for his trailer, which blew a hub on the way from Ely to the finish line. With the help of other racers, Dennis was able to limp the trailer to Las Vegas where repairs we made Monday afternoon prior to heading home. Despite that expensive setback, Dennis had a great time at SSCC this year and will of course be encouraging others to again come next year. He may also show up for the Nevada Open Road Challenge (NORC) in May, which has been turned into a two-way race. It's Dennis' fiery brand of leadership that keeps Panteras coming to this event year after year. Soon, the Pantera will be one of few brands older than 45 years old showing up to these races, turning heads, and making waves. In 2014, John Bentley experienced an on-course loss of oil pressure and exceeding high oil temps that forced him to terminate his run about 30 miles in. From that moment, he dedicated himself to finding a new 351C engine block and building a new and stronger engine. He nearly made the 2017 race until a broken stud prevented him from replacing the starter just a week prior. John took that opportunity to use the next year to double-check, re-tune and get his Pantera as ready as possible for the SSCC race in 2018. As the team anxiously waited for his arrival in Ely, John experienced a flat tire on his trailer coming in. After quickly changing to a spare, he met up with the team just a little later than expected. John later had the tire replaced in Ely, giving him two spare tires for the return home. Come race day, John was the star as the team later found he had managed to take second place in the 120 MPH class with a time variance of 0.4318 seconds. Unfortunately, John wasn't at the awards banquet in Las Vegas, electing to drive back to Ely, load his trailer and drive home to be back to work on Monday. In a "double-unfortunately" bit of bad luck, John would need those two spare trailer tires. Somewhere outside of Ely on his way home at about 2 pm, John's borrowed trailer had it's second flat tire of the trip. He quickly changed out one of the spares and was back on the road. Later that same night, still on the road home, the trailer blew tire number three for the trip at about 10 pm. This used up the final spare tire he had available. After changing it out, John made it safely home. Dennis will deliver the second-placeTrophy to John the next time he sees him. The team would also like to recognize Paul Katchadourian who again offered a level of sponsorship to Team Pantera Racing, as well as taking part racing his own Viper and coming in fastest in his class. Also in attendance this year was Laure Basile who acted as a team photographer throughout the event and posted many of them to various forums or facebook pages. The team extends its thanks to Laurie for helping spread the word about Panteras in open road race events. David Adin also came over from Durango to lend his experience, assistance and take photos of the team at the start line of the race. Peter Menyhart came as usual to lend an experienced hand and let the team know he's shooting to have his Pantera ready for next year; he's closer than ever. All Pantera drivers put out an extraordinary effort to make the SSCC race this year, especially Mark and Gerry for travelling the longest distance only to come short of finishing the race. The extraordinary trailer failures experienced by both John and Dennis are also hurdles that had to be overcome both to get to the race and to get home. In terms of time spent, efforts expended, and obstacles overcome, each of these drivers exemplified the spirit of the Iron Man in open road racing and are deserving of Team Pantera Racing's highest honor. John Bentley has worked out the little gremilns that plagued his transmission bellhousing last year and has already made several test runs and is in the process of doing a final dyno tune to be ready for this year. 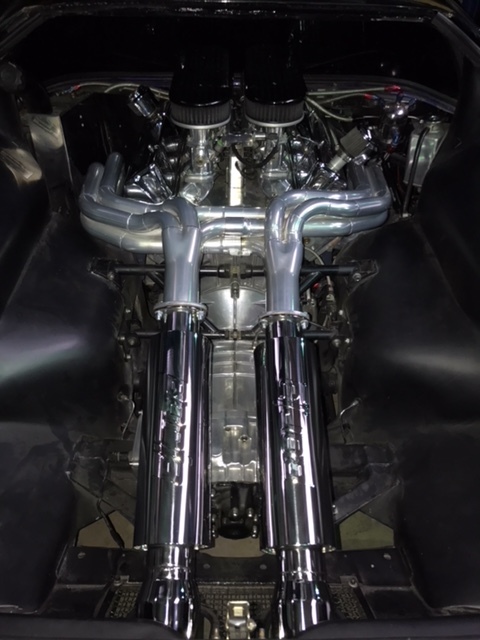 Rumor has it the President of the Pantera Owners Club of America, Gerry Romack will again join uis with some engine mods and other updates to his Pantera. Not least of all will be Dennis Antenucci returning in his Pantera a with a newely refreshed engine, brakes and other top-secret go-fast goodies. Rounding out the team, whether or not they race, will be Peter Menyhart, Asa Jay Laughton, Laurie Basille, David Adin and potentially one of our "Crazy Dave's" at large. What started as the potential of having five Panteras at the 2017 30th anniversary running of the Silver State Classic Challenge, turned into two Panteras, both running and finishing. Those who dropped, still attened in a lesser capacity and the team still had loads of fun. 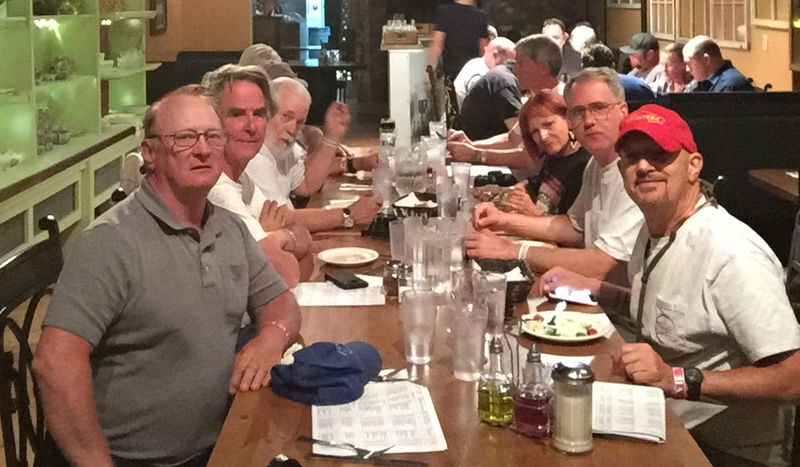 Included in that fun was sharing the experience with the 2017 Pantera Owners Club of America (POCA) president Gerry Romack. The first to drop his Pantera from running was Peter Menyhart, who came very close but in the end needed a few more things that were just out of reach. The team is determined to make sure he has the final things in place next year. Next to drop was pretty much a tie between Mark Skwarek with a leaking head gasket, and John Bentley with a broken starter mounting bolt. In the end, neither racer could get the last minute items fixed in time. Still, Mark Skwarek attended in a suitable street car and ran in a lower speed class against (of all people) Charlie Friend. Mark squeeked out a second place against Charlie which puts him in good standing. John came and shared the experience but did not race. The real story of the weekend belonged to Gerry Romack. Gerry had bee planning to run for several months. However, in an unfortunately turn of events, Gerry had two things that would end up ensuring him the Iron Man award for 2017 if he could pull it together and finish the race. First, his car ended up damaged and requiring a little bit of bodywork and paint. Next, Gerry found his engine had a problem and there wasn't time to rebuild. In an effort nearly nobody else could pull off, Gerry contacted Dan Jones of the 351 Cleveland Dyno project fame and was able to secure the Dave McLain Dyno mule. With Team Pantera Racing Veteran Dave Doddek and additional Pantera friends Alan Camaron and George Scott (and his son) pitching in to help, Gerry had his Pantera on a trailer and headed to Nevada from the Great Lakes region within a couple of days. He made Las Vegas in time to secure his Rookie School certificate, which is needed when a racer runs either the Nevada Open Road Challenge or the Silver State Classic Challenge for the first time. With certificate in-hand, Gerry took the rest of the day off to recover, recoup and get rest for the drive to Ely. Once in Ely, the team greeted him with enthusiasm; he would have the only other Pantera there next to Dennis Antenucci's multi-race winner. It wasn't all fun and games just yet though, Gerry knew there were a couple of things he wanted to check on before heading through Tech Inspection. Every TPR member jumped in to help at one point or another. It may be hard to believe from a couple of photos showing everyone playing "supervisor" in a lawn chair as Gerry struggled in the trunk space of his Pantera, but everyone did something with Gerry at some point. Mark and Peter jumped in early to help diagnose a brake problem that turned out to be a bad brake line. The team removed it and with help from the local NAPA were back to bleeding the system until it was solid. Once finished they turned toward the hydraulic clutch bearing. Gerry had complained that his clutch felt very bad so Asa Jay Laughton who again came without a car to run, jumped in to help bleed the hydraulic clutch. The process yeilded nearly a full pint of thin dirty grey water before getting decent slightly amber brake fluid. Once new fluid was coming entirely through the system, Gerry took the car out for a spin and came back with a grin that told everyone the clutch was working a whole lot better. A few final checks of basic tech items and Gerry head off Saturday morning to the car show in the park to have his car tech'd before parking with Mad Dog. He passed without any issues. At this point, all Gerry had to do was start -and- finish the race to earn the coveted Iron Man award. Gerry Romack, president of POCA and Dennis Antenucci, a former president of POCA both started and finished the SSCC for 2017. This race marked a milestone in that three past or present POCA presidents had run the Silver State Classic Challenge, and finished. With an 11th hour engine swap, a herculean drive to Nevada, fixing some serious mechanical problems right before tech, starting and finishing the race, Gerry Romack deserved, and with a unanimous vote of his veteran peers, rightfully earned the 2017 Team Pantera Racing, Ellis Woumnm Memorial Iron Man Award. Congratulations Gerry. The lesser story of the TPR Team in 2017 was that of Dennis (Mad Dog) Antenucci, whose Pantera went to Don Byars Full Throttle Panteras to have the engine extracted and sent to Russ Fulps for a refresh. While there Dennis had a myriad of other small tasks done to the Pantera to bring it up to snuff and all it's masculine glory for the race. As it was, a few minor glitches from Murphy (of Murphy's Law fame) happened upon Don's shop making it such that the Pantera was "just" ready when Dennis and Asa Jay arrived with trailer in tow to pick it up on the way to Ely for the Race. 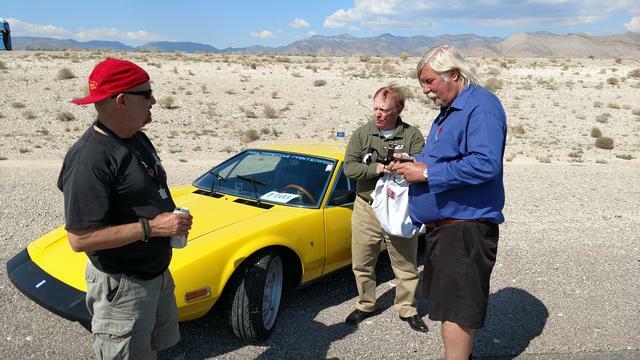 Dennis' Pantera ran fine, finished the race fastest in class, and because of all the effort put into the last-minute work, Don became nominated for the SOBill award and was subsequently voted to receive it. For his efforts in helping Gerry Romack, diving in to assist with coveralls and gloves at the ready, Asa Jay Laughton became nominated for the Gary Hall award and was subsequently voted to receive it. In all, counting the Team Pantera Racing sponsor Paul Katchadourian and his Dodge Viper, the team had seven members at the event, four drivers and four finishers. Another successful year for this team and open road racing. Ellis Woumnm Memorial Iron Man Award, for showing stamina in the face of overwhelming odds, working hard against deadlines, parts shortages and other difficulties in order to participate in an Open Road Racing event with Team Pantera Racing, successfully finishing the race without disqualifying, and showing team spirit and a dedication to preserving the heritage of the DeTomaso Pantera. The Sweet Old Bill (SOBill) Award, for being a reflection on SOBills spirit of giving to the Pantera community, for unselfishly providing assistance to TPR members and other Pantera owners in the spirit of "paying the favor forward." The Gary Hall Memorial Award, for the Team Pantera Racing member who shows outstanding support and dedication to both the DeTomaso marque and the TPR team, who participates in racing events in a continuing effort to preserve the driving heritage of the DeTomaso Pantera.